A journey East took us around Philadelphia, across the Delaware River, and into Riverton, NJ where we had reservations for Afternoon Tea at The New Leaf Tea Room. A brisk January day provided the perfect afternoon to enjoy The Queen's Tea. The Queen's Tea includes the selection of soup du jour or salad. Most in our group opted for the potato leek bisque which was very tasty and served in a tea cup. After the soup, we were each served our own individual clam shell tray that held the sandwiches, scones with fruit, and the top tier of little desserts that practically screamed 'eat me first'. One happy family photo before we began sampling the tea time goodies on our trays. The vegetarian sandwich plate included an egg salad triangle, a cucumber sandwich with cream cheese, and a pimiento cheese spread with sliced pepper and tomato and a slice of spiced tea bread topped with cream cheese and pecans. The cranberry scone was lightly dusted with confectioner's sugar and served alongside a fresh fruit medley. And the dessert trio was a chocolate lover's delight that featured a chocolate dipped strawberry, a chocolate brownie with whipped cream topping, and delicious frosted cupcake all drizzled with chocolate and dusted with confectioner's sugar. Oh yum! After tea, there was an opportunity to do a little shopping in the gift shop. Two holly designed Christmas tea cups came home to be added to the holiday collection. Hugs to you on your special day! Oh my Goodness, the newest book by The Essential Herbal is amazing. It is 450 large 8 1/2 by 11 pages chock full of herbal information. Incredibly well indexed by topic, authors name, herb, recipe or craft. It is clear this book was a labor of love. Tina Sams, editor of The Essential Herbal Magazine, (and Molly's mom), has pulled together a fabulous compendium of the second five years worth of favorite articles. This is the cream of the crop from 2008-2012, and cream it is! The Essential Herbal draws an interesting array of authors all with unique and first hand experience with herbs. And it shows. It is clear these folks are not just writing about herbs, they are actually working with these amazing plants. If you only have room on your bookshelves or in your budget for just one new herbal this year, I would strongly suggest you consider this book. It has a huge variety of topics from growing herbs, medicinal herbs, culinary herbs, history of herbs, and crafting with herbs. It features basic herbs and unusual (but not obscure) herbs as well. Since it is a compendium of articles, I appreciate the fact that I can pick it up and read an article or two and then easily put it down until the next time. Since The Rosemary House opened its doors in 1968 we have been teaching about herbs. Whether it is through our classes or workshops or in our Apprentice Gardener Nights or through our internship programs we consider sharing about herbs and their uses an important part of our work here. We are lucky to welcome Molly Sams from the Essential Herbal this year to The Rosemary House. She is fun, enthusiastic, talented and a joy to be around. We consider ourselves lucky that the Essential Herbal shares her with us! Below is what Molly has written about us! I have been interning for The Rosemary House for the past few months. Every day is something fun and different. Being able to learn about others’ perspectives and uses of herbs has helped me become a better herbal novice. Susanna is always encouraging me to learn many aspects of herbs. Whether it is something as detailed and complex as folk medicine or potpourri, Susanna continues to be a phenomenal source of information and encouragement. She is also an endless amount of fun. My coworkers have been an unexpected wealth of information. Last month I had the opportunity to work with Lori. She was able to answer more questions about Hex craft and PA German magic with such detail I could not write my notes down fast enough. Another wonderful person I often work with is a young woman named Destiny. If she and I aren’t singing show tunes or discussing the latest episode of American Horror Story her ideas about herbalism in cooking can always lead to an interesting conversation. The customers often have interesting ideas about herbalism as well. While some are just beginning to learn about herbs, others are able to offer ideas and advice as they look around or check out. Her children are always a blast to be around. Cedar can crack me up with his wit and timing and Angelica and I can often be found howling with laughter in the backroom after she gets home from school. The delicious food is a great perk, too! Here's a sneak peek at the display window for The Rosemary House for the month of January. Celebrating Hot Tea Month with sparkly little white lights and sharing an assortment of all things tea, it's the perfect time to celebrate tea! Staying warm with hot tea nestled under a tea cozy, sipping and delighting in the warmth of a colorful pot of tea, January is the perfect month for tea. I save my ends of celery or bits of wilted celery, onion parts, carrot shavings or ends, stems of herbs, mushroom pieces, pieces of left over green and red pepper. Mostly pieces that would have gone to the compost. I throw them all together in a zip lock bag in the freezer and when the bag is full, I put them in a large stock pot with filtered water. To that I add 2 small potatoes cut up, some garlic, a bay leaf, 8 whole peppercorns, a tablespoon of white miso, and some oregano. Let it all simmer together for a minimum of an hour but usually closer to 2 hours. Cool it down in the pan and then strain it out. (Now the stewed veggie scraps are ready for the compost!) I just strain it through cheesecloth. If I strained through a coffee filter it would be a very clear broth but I don't have the patience for that. I then freeze the broth in 2 cup or 4 cup measurements. This is simply perfect as a base for soups or to simmer lentils. It's easy and yummy, and you know exactly what the ingredients are and where they came from. It isn't a good Christmas if there isn't a new book under the tree. This book by the Cooperative Extension of the University of Georgia is an excellent book, with all the current information on preserving foods. It covers canning (of meat, veggies, fruits and jams), freezing, dehydrating, making vinegars, pickling and so much more. In its revised 6th edition, this comprehensive 387 page book, features hundreds of recipes as well. While there is a lot of information here. I am finding it very easy to read and to comprehend and am enjoying this treasure quite a bit. And a gift from the eldest sister, for no particular reason except that she saw these at a Garden Club fundraising event and thought of me! and aren't they just adorable! Over the 25 years (!) that Sweet Remembrances has been in business pouring tea and making scones, friends have become very supportive customers in the tea room, and tea room customers have become new found friends. That concept was confirmed this past holiday season when I received these two tea related bracelets. This bracelet was from a previous tea room owner. Our friendship has grown, our love of tea unites us. Sweet memories of her tea room remain in my mind as that is where friends and family gathered for a memorial tribute after Mom passed away. I was touched when she gifted me with this pretty little bracelet. The bracelet is shown here on top of a birthday card I received last year from a long distance Internet friend. Tea unites us across America! And this colorful bracelet was a gift from a customer now turned friend. It was a surprise to receive and a joy to have. A special thank you to friends near and far, and to the many tea room guests over the years that have become forever friends! This delicate silver tea strainer with drip catcher was an inheritance gift from friends of the family. Once belonging to our mother's best friend, it now happily resides in the tea room, a quiet reminder of yesteryear and the bonds of friendship that forever unite us. This other vintage metal advertising strainer, showing it's age, was tucked in the toe of my Christmas stocking. It reads 'All Allen's Teas & Coffees strictly guaranteed'. Although it doesn't quite hold the place of honor as the teapot shaped strainer, it will be tucked among the other collectibles in the tea room. This adorable little Tea for One combination was a gift from a friend. The tea is brewed in the upper portion of the set, and then once brewed, it is poured into the lower section which is an oversized teacup. Such fun! It brings a smile to my face when I use it - remembering the friend that passed it on to me and rejoicing in thoughtful acquaintances. This darling glass tea pot ornament was a holiday gift from Susanna. Although purchased in PA, it was handmade in Egypt and according to the information attached to the teapot, it was mouth blown, engraved with its own unique design, accented with 24 Karat gold trim, painted and fired to create this truly elegant treasure. Although I was with her when she purchased it, it was a surprise to open the little box and be reminded of our bus trip to Wheaton Arts Village this past September. What a perfect souvenir! 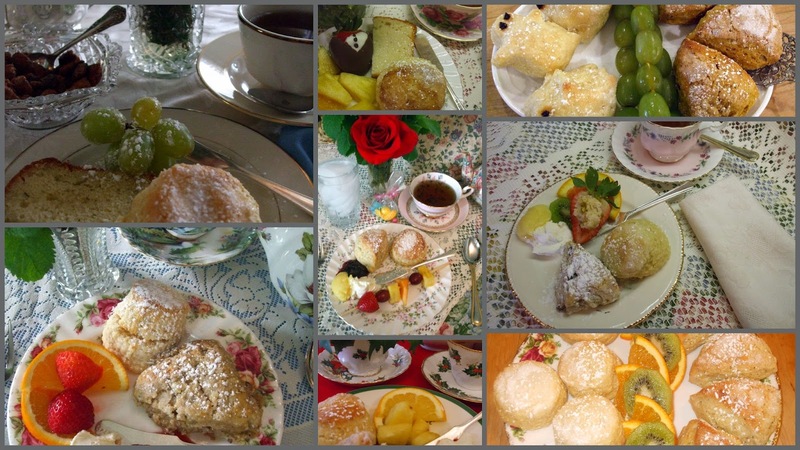 These scones are always served in the tea room, alongside a flavored scone, fresh fruit, and a variety of toppings. Many guests request our scone recipe, so here it is. Enjoy! Mix flour, baking powder, sugar, and salt in bowl. Cut in butter until crumbly. Lightly beat eggs, add cream to eggs. Mix egg and cream with dry ingredients; mix to form dough. Knead for 30 seconds on lightly floured surface. Roll into a circle 3/4 inch thick. Cut into rounds with 2" cutter which has been dipped into flour. Re-roll dough, and continue cutting circles. Place on baking sheet. In a small bowl, mix 1 egg white with 1 tsp. water. Brush onto top of cut scones. Sprinkle with sugar. Bake 425 degrees for 13 - 15 minutes. Yield: 12 scones. Serve warm, lightly dusted with confectioner's sugar, with your favorite toppings. Make sure your baking powder is fresh or the dough will not rise. Do not overwork/over handle the dough as that will create a 'tough' scone. Do not roll the scone too thin as that will create a 'flat' scone. Serve these scones fresh from the oven! January marks the beginning of both the new year and National Hot Tea Month. A month long celebration of tea drinking (well really, who are we kidding, we celebrate for twelve months). In our family, we have an 11 year old non-tea-drinker that has been counting down the days to his 12th birthday ever since the first 'Happy New Year' was exclaimed (24 more days in case you were wondering). Here's hoping your new year is joyful, your resolutions hold fast, and you take time for tea during this extra special tea drinking month. Finally! The long wait is over - Downton Abbey returns tonight on PBS! Are you ready? Do you have a snack tray prepared? or did someone else prepare one for you? What are you drinking tonight to celebrate the return of this dramatic series? Tea? Do you see yourself as upstairs or downstairs? Perhaps both! Happy New Year - 2015! Looking Back - 2014! We began 2014 with several Super Scone Sunday events - which will be repeated again in the new year. Oven fresh scones, assorted toppings and fresh fruit accompanied with hot pots of properly brewed tea. and Valentine's Day teas in February! March introduced the first of a series of 'First Friday Dinners' scheduled throughout the year. Since the dinner was prepared and served by Mountainside Supper Club, we actually sat down and enjoyed the evening. Now that's special! In April, we hosted three Downton Abbey teas that featured a visit from the Dowager Countess. Looking forward to the return of Downton Abbey this month, and a host of teas later this year! The gardens came to life in April and we had a host of earthy events including an introduction to herb gardening class, Earth Day Festival downtown, and a Make your Own Fairy Garden session for mothers and daughters to design. May celebrates Mother's Day while June honors the Queen! July is fun with Tea & Tarot readings. In August we enjoyed a themed tea featuring hand bags. In September we welcomed the Tea and Hat Lady for a program on hats! The guests at this special tea enjoyed sporting their favorite chapeaux! 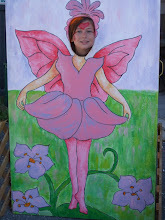 Our Fairy Festival is always in September delighting an amazing number of young children! In 2014 we journeyed to two different destinations on our traveling herb seminars. June included a visit to gardens in Delaware and a trip to Winterthur to enjoy the Costumes of Downton Abbey exhibit while an overnight trip to Cape May was a highlight for many in September. Three Halloween Teas in October kept the tea room busy with ghost, ghouls, and goblins all in attendance. Craft classes in December included making a Pinecone Garland one night and decorating a manger with herbs on another evening. Other craft classes throughout the year featured needle felted pendants, kitchen medicinals, bay leaf wreaths, and fermenting foods. The first Holiday Tea of the season started on Black Friday and the last holiday tea was the Candlelight Tea on the eve of New Year's Eve. It has been a busy year! Thank you for visiting Sweet Remembrances and The Rosemary House this past year! Wishing you much happiness and hoping you are able to celebrate with us in the new year!